The fate of the horseshoe crab seems to be dismal and worth the attention of an experienced artist’s touch, one that many would believe New Mexico artist Puppies Puppies to have. One might catch themselves thinking: this seems like an important project, I’m surprised more people do not know about this, as they leave the Freddy Gallery on West Franklin. But are we to believe that Puppies Puppies solely purposed this show to raise awareness of a ‘forgettable sea creature with a hidden chemical superpower?’ I feel there is more to discuss here. 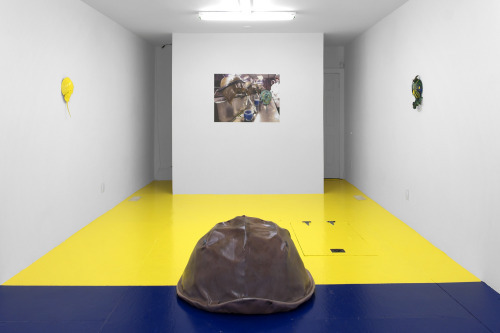 The most recent exhibition at Freddy Gallery features painted horseshoe crabs and vinyl works in addition to a live performance. The work is seemingly focused on giving a visual explanation of the LAL test, which involves the use of a chemical found only in the amoebocytes of the horseshoe crab’s blood cells. “Pharmaceutical companies burst the cells that contain the chemical, called coagulogen. Then, they can use the coagulogen to detect contamination in any solution that might come into contact with blood. 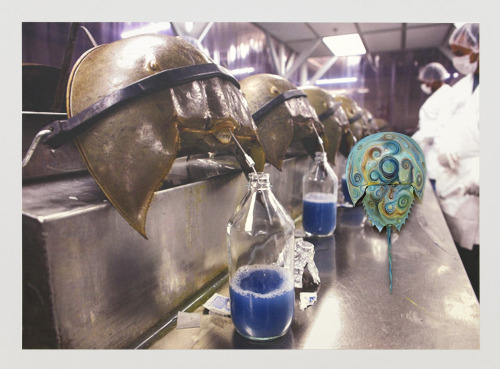 If there are dangerous bacterial endotoxins in the liquid- even at a concentration of one part per trillion- the horseshoe crab blood extract will go to work”- by turning the solution into a ‘gel’ substance. Nonetheless, to paraphrase the press release, virtually every American who has ever received an injection has been protected because we harvest the blood of the horseshoe crab. I believe the most critical part of the exhibition lies on the back of the press release itself. The horseshoe crab… It has evolved onnnnly so much as to further its existence & existence it has achieveddd…. 445 million years worth….. horseshoe crabs and paintings seem to relate in my mind. They are expressions that have survived the test of time. By linking the two I’m expressing my need as an artist (not by me being the actual artist that painted the paintings) but my need to present the paintings in this context. Maybe these expressions are addressing my need to survive and to hide under many layers in order to do so. To understand my fleeting existence but know that humans like me will continue to paint. To breed on the shoreline in shallow water only to propel the existence of my expressions and the expressions to come later on, I feel very deeply for these creatures. It is very tempting to digest this direct statement from Puppies in a binary sense (them commenting on a relationship between a human and external [natural] world). This would be a very stale modern take on an issue that, for the most part, a large percentage of us have gone our whole lives not caring about. Though Puppies only mentions man and horseshoe crab, I believe him/her to be outlining a more overarching network of thoughts. I believe it would also be very tempting to spout a thematic ecological discussion that would leave us all feeling very sorry for these poor, poor creatures. If we do choose to take thatroute, how are we then supposed to feel about painting? How are we then supposed to feel about our own reproductions through the everyday (facebook, snapchat, everyday performative gestures, etc.). Puppies speaks about the need, obligation and instinct to procreate in both the production of paintings and within the horseshoe crab population itself. The relationship that Puppies finds between the two owes itself to many more things than just the initial similarities one may find. I begin to think of all the other happenings required for the two processes of production discussed earlier to take place. I do not want to view this relationship being described as one that temporarily floats above the mechanics of the everyday. I think of the full moons and high tides necessary for a typical horseshoe crab mating season, or even the worms and clams that form the horseshoe crab’s regular diet. The average contemporary painter steps outside their mating process as they journey to the local art store to pick up the necessary paints, stretchers and canvas. As one starts to form a list of every thing related to the process of duplication, mating or ‘creating’ (as the romantic painter would believe) and then a respective list of all the things related to that long list of things first handedly related to the original act, it changes the way we speak about things commonly idealized as being autonomous such as painting or horseshoe crab mating. I think now we are drifting towards a more Latourian approach to dissecting just what this show is trying to dance around. If we take, for instance, French Sociologist Bruno Latour’s actor-network theory (which treatsobjects as part of social networks) not only does it do the job of removing humans from a metaphysical top-tier in any analysis we try to mount, it also mobilizes horseshoe crabs as a driving force in that same relationship (able to act or participate in that same list of networks). If we instill within the horseshoe crab, an ability to act or participate actively in a system of networks (not through animism or our imagination, but rather through a pseudo flattened ontological mindset) we begin to tred into a conversation that is more entertaining and definitely a lot less lonely. We become less lonely in a sense that we may begin to realize we share the stage (as both humans and artists) with a lot more actors who have just as much if not more experience as us, that population no longer swept to stage left and labeled as other, everything else, or even people(as some ecological discussions tend to drift towards). To be perfectly honest, a hyperobject such as a horseshoe crab is a great stage partner to have. The instinct to reproduce (whether painting or horseshoecrab mating) may not be one that is mythical or something that we humans or artists should find unbelievable and/or beautiful. The horseshoe crab may in fact be acting within its networks and among its set of alliances (which give justification for its existence not in a sense of purpose but in a pure empirical sense). As the horseshoe crab continues to breed on the shoreline in shallow water only to propel its constant ability to act, to change and grow (not so that on one far off day it may be free to live peacefully on its own, but rather for the sole purpose of expression, of acting), painting continues along a parallel trajectory. Painting can so often be a dreamy, mystical process of magic that happens when an artist is in their studio. Here, Puppies suggests that the initiative to paint is the same as a horseshoe crab’s performative act of reproduction. The fewer alliances an actor forms or has, the weaker their grip becomes on existence, therefore, painting (and, to a greater extent, art) survives (and is beautiful) through its alliances with other networks and its opaque malleability. I feel that both the painter and the painting should not colonize their way through the everyday. It may be because of this notion that makes it a perfectly appropriate move for Puppies to have not painted or even fabricated any of the visual components of the show. The fabulous myth of the painter lives on. Their ‘shared stage’ allows the perpetual act of recreation and duplication of painting to continue unfettered (even more so than the typical show we have become used to seeing). Puppies truly connects to this sea creature not in an animistic-type sense but in a sense that they are comfortable enough to share the stage. To say (in this instance) that it does not in any way really matter who painted or fabricated each piece (be it a professional artist or a more visionary-type painter), that would not be so bizarre would it? Perhaps in remembering the artist’s various trips to the art store, high tides and pb&j’s we may begin to derail the magic of the artist and of ‘nature’ and understand our own initiatives as well as those around us as we begin to share Puppies’ feelings towards this forgettable sea creature. 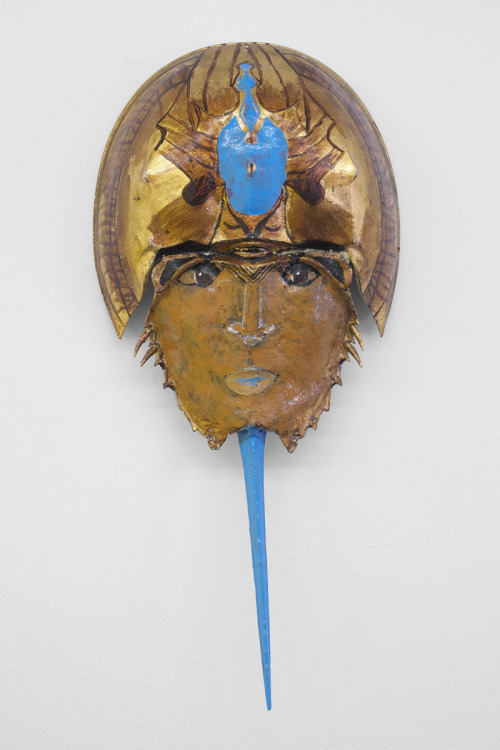 HorseshoecrabsHorseshoecrabs is on view through September 26 at 510 W. Franklin Street, Baltimore, MD. All images courtesy Freddy Gallery. Joint published with Temporary Art Review. Find this review in short form at their site.